About six years ago, I really thought Terrell Brandon was going to stand me up along with freelance (I still owe you, Pat) photographer, Patrick Ulch. I was living in Portland at the time and working as a freelance writer with ESPN.com/Page 2 and had pitched my editor the angle of sitting down with Brandon at his barbershop in Northeast Alberta about his rise to businessman from Oregon to the NBA, where the Portland native became a two-time NBA All-Star and 11-year veteran with Cleveland, Milwaukee and Minnesota. Even back then I was very interested in players making that transition out of the league and into the realities of operating your own business, so the feature and Patrick’s photos helped capture that interest and TB’s business venture. I can remember thinking about growing up in Corvallis and catching those Oregon State versus Oregon games, watching Brandon and Gary Payton go head-to-head. I can remember wondering if I had mis-scheduled my meeting at the barbershop or missed a call or text message from TB asking to reschedule. But when the side door opened to the shop and Terrell walked in sporting a crisp red Montreal Expos hat and his signature smile, I knew we’d have a great talk. “Sorry I’m late…you just never know who you are going to run into around here,” Brandon said as he exchanged quick handshakes with a couple of customers waiting to have their hair cut. That was the case then. 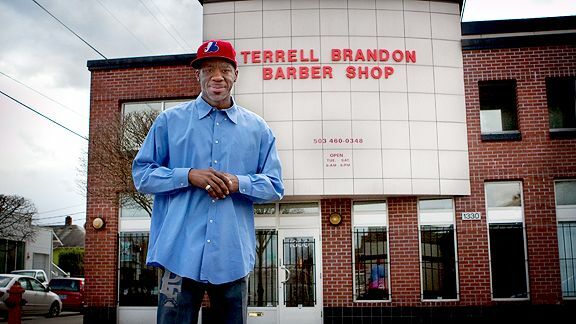 Orlando Williams of Comcast SportsNet Northwest sat down with Brandon at his barbershop in Northeast Portland, where the two former Oregon Ducks and Portland natives (Williams played at Benson, Brandon at Grant) got into everything Blazers – from breaking down Damian Lillard and CJ McCollum’s backcourt game, adjusting Portland’s defensive game plan and differences in playing during Brandon’s day from 1991-2002. Considering Portland’s recent woes, Brandon isn’t far off. Lillard and the Blazers in general need a lot of help. A swingman is a good way to go, but so is a big man that can help bring a physical presence and much-needed defensive toughness to the table. I’m not sure if there are plans to involve Brandon in more of these CSNNW segments or hopefully bring him in studio to expand his platform. Either way, count me as one of these guys who enjoys spending time with former NBA players and learning how they’d utilize their rich experiences around the game to get involved and give back to the game and younger players on the come up. Terrell Brandon may have kept me waiting to work on that story together, but his takes on the Blazers and the NBA in general are right on time.